When it comes to a first draft, for me there’s nothing like a good Word Count taskmaster sitting at the bottom of my Word document, chiding me to push on. Word counting, however, has become ubiquitous and I’m starting to wonder if it’s more a sign of our uber-chatty, product-and-information-based culture, than it is a tool that actually helps push forward good writing. Writers who seriously discuss their word counts sometimes remind me of those eighth grade reading classes that measured how many words one read per minute. Remember those things? You centered your book on the table just so, and a bar of light ran down the page. By then, I saw myself as a pretty serious reader, but all these other kids were flipping pages like Howard Stephen Berg. Remember Howard Stephen Berg? In my early twenties I was more serious than ever about my reading speed. I was halfway through my first graduate school experience, and was flush with enthusiasm for understanding and interpreting religion and all its ensuing humanities-related fields: philosophy, theology, history, psychology, philology. On several scholarships, my primary job was to read, study, learn. It was a good life (other than having no spending money and a scant dating life as a possible future minister), which would be made all the better if I could simply cover more ground in less time. Thus, I was hooked by the persuasive Kevin Trudeau and his partner, Howard Stephen Berg, world’s fastest speedreader. They guaranteed that the Mega Speed Reading course would at least quadruple my reading speed—or my money back. Now that was a guarantee I couldn’t afford to pass on. I followed the techniques, and with some solid concentration, I’d say at best I may have doubled my reading speed. This is what I told the operator when I asked for my money back. “I was guaranteed a quadrupled reading rate. It was only doubled.” In graduate school covering a lot of ground is an inherent advantage, no doubt. Reading as a writer? Absorbing style and techniques, not to mention simply enjoying the ride? Is the winner she who reads fastest? 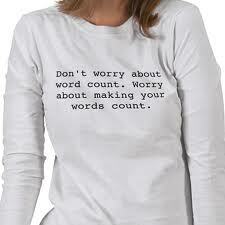 I recently had dinner with Susan Gregg Gilmore who says she pays no attention whatsoever to word counts. She may be an exception to today’s rule. There are days over the past couple of years where I’ve really enjoyed having some kind of yardstick for how “productive” I was as I generated yet another series of first draft material. I’ve set goals like a 2,000 word per day average for five days a week over 13 weeks will produce a first draft. My PR stood at a couple of 4,000 word days until I broke through with back-to-back 5,400 and 5,100 word days. What I like about the concept is that if you hold yourself to a high number, you can function as your own kind of project manager, pushing through creative obstacles and making decisions that you might have otherwise gotten hung up on. That certainly must “count” for something. It’s also a reasonable monitoring device that helps guide one toward an overall goal. 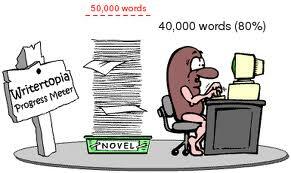 At this stage in my novel writing, I am wary of crossing the 100,000 word divide. Thus, when I’m pushing that margin (as I have for Simon Krimple’s Wager), I have a kind of guide to assist in the balance of scene, character, subject. What I don’t like? After that first draft I find myself too conscious of the word count. How many words have I cut today? Is that an inverse progress? Why does it matter? I’m also adding material that needs development. Probably the single-most obvious issue is that quantity always loses to quality, and there’s no immediate measurement for that.